Woh. 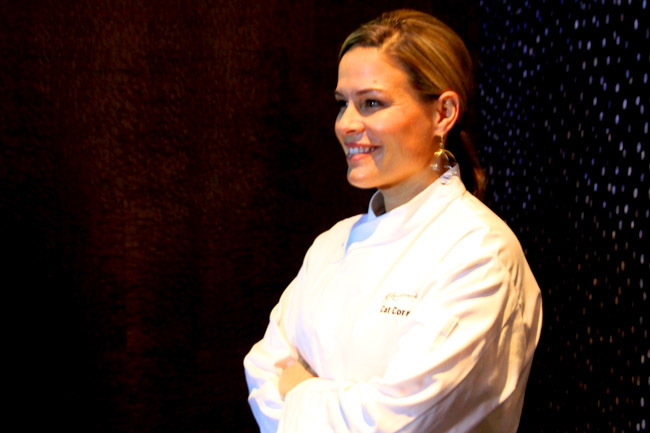 The first and only lady Iron Chef Cat Cora has joined Resorts World Sentosa to open the Ocean Restaurant. I was partly star-struck when I met this celebrity chef with an impressive resume, known to be an accomplished restaurateur with six restaurants under her belt, a television host of Around the World in 80 Plates, and a guest judge on “Iron Chef”. She is very out-spoken, humorously-friendly yet with a sense of authority that you know can call the shots in the kitchen. You would get that sense during photo-taking with the pose with her usual arms-folded “I am confident” air. Cat’s (whose original name is Catherine) passion for life and food is admirable, being a proud mother of four sons (born with her partner Jennifer Cora), with style of cooking influenced by Julia Child, Barbara Tropp, M.F.K. Fisher and her grandmother, Alma. 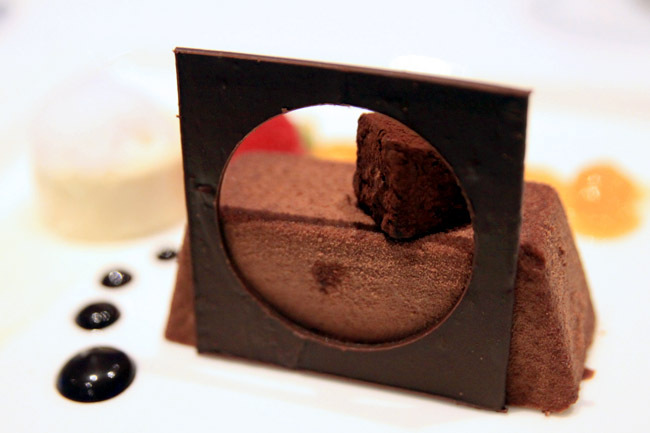 Her collaboration with RWS marks her first restaurant in Asia. Some of the new dishes at Ocean Restaurant by Cat Cora are Mediterranean-Californian influenced with a touch of Asian elements as she believes in incorporating local ingredients into the dishes. 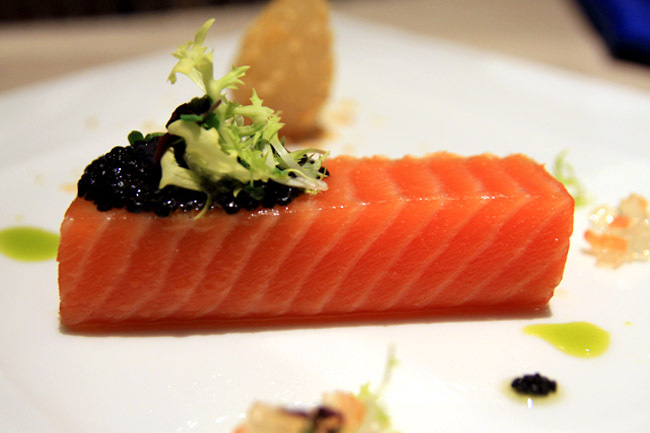 There are some of the Iron Chef’s signatures, such as the Sous Vide 48°C king salmon topped with sustainable caviar and accompanied by Prosecco pear crushed almond, vine tomato jelly and garden cress. 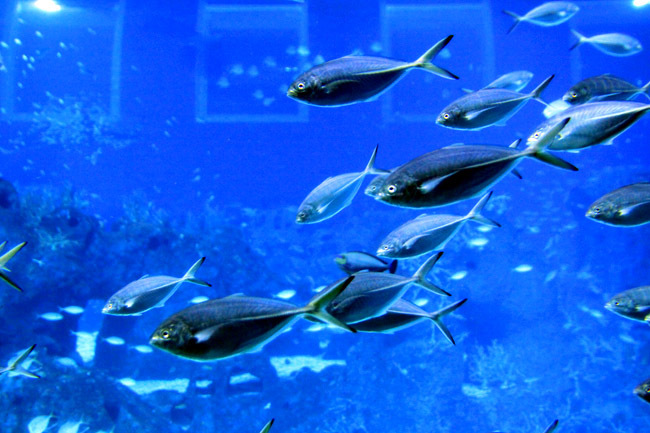 All prepared by using sustainable seafood sources. The “Cat Cora Experience” 5-course tasting set dinner at $158++ was surprisingly not as steep as compared to other celebrity chefs’ offerings. But I still come with a higher than high expectation. Amongst which, my favourite dish was the Sakura Shrimp Risotto with Morel Mushroom-Black Truffle Butter Ikura ($28 ala carte). 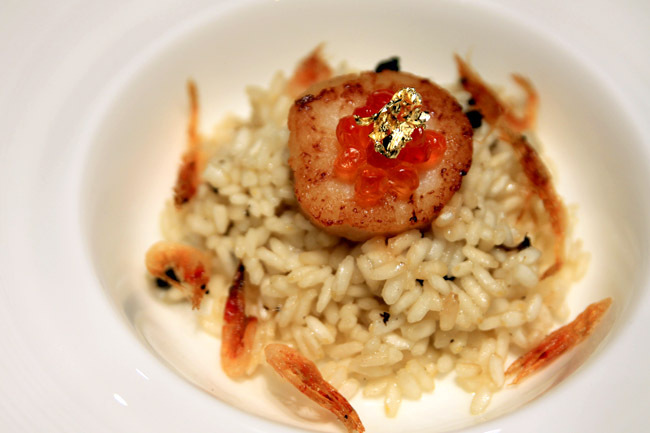 There was a smooth balanced blend of textures, from the creamy risotto with the lightly fried crispy sakura shrimps. Most risottos would have been too heavy for me usually, but this was light and satisfying enough. Unfortunately (and ironically for a seafood restaurant), the seared Hokkaido scallop could have been a lot fresher and juicier. 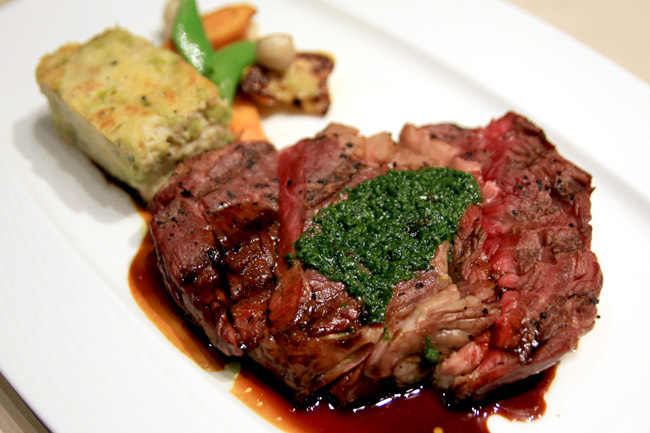 The Grilled Basque Wagyu Striploin, with Leak Bread Pudding and Roasted Sesame- Coriander Vegetables ($120.00 carte) was another favourite, with the meat very evenly prepared, juicy and excellent in execution. There was an interesting tang of coriander-spiciness that our table was divided on – that it was on the heavy side and masked the original savour of the meat. 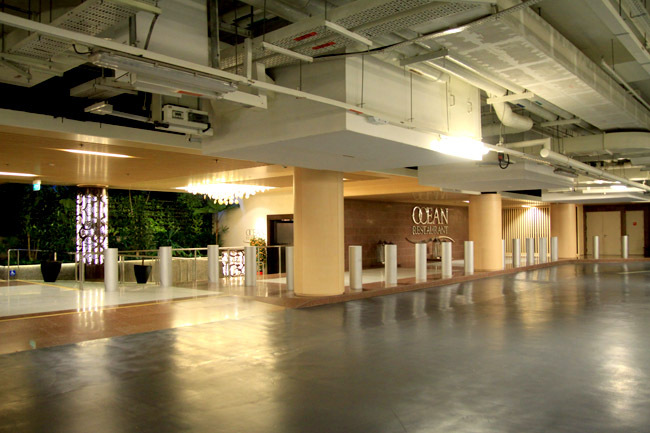 Ocean Restaurant is likely to be one of the most beautiful and magical in Singapore, located right inside the S.E.A Aquarium. I am not exaggerating. 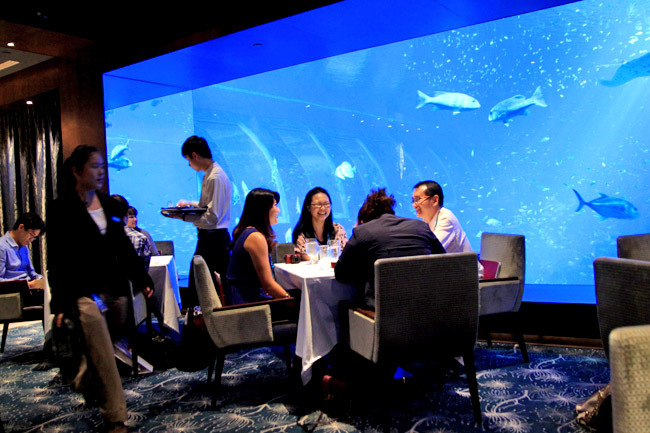 You dine with thousands of marine life right beside you, with the Ocean Gallery – the world’s largest aquarium viewing panel just next door. The deep blue sea colours are just breath-taking, as you may get the same sense of peace that I did when the stingray whizzes by. Hey Daniel, thanks for that lovely comment on my blog. You’re right about this place being magical. It truly is. And it was such a joy to meet Cat Cora! She definitely makes Iron Chef America more interesting to watch!